Heavy rain is expected to continue across the entire Philadelphia region throughout Sunday and overnight with a total of 2 to 3 inches of rain. A Flood Watch is in effect for the area as well, mainstem river flooding is not expected, but you should prepare for minor flooding of prone areas. All of this precipitation is much needed since we have been well below average for the entire year. This same system, which is typical April showers here, is going to bring havoc in the western half of Pennsylvania overnight. Much like the Halloween 2011 storm we had just 6 months ago, this storm is going to dump up to 8-12 inches of heavy wet snow on trees with new leaves. Widespread power outages are expected due to downed trees and lines. Tomorrow the storm will clear out, but it will be cooler. High of 53 in Philadelphia. is the second annual week organized by Technically Philly and there's no shortage of events happening all day, every day this week around the city. From PTW site, “Philly Tech Week is a week-long celebration of technology and innovation in Philadelphia. The annual week of events is intended to grow the impact of this innovative region through programming focused on technology, collaboration and improving Philadelphia.” Check out the list of Events and get involved. This year's theme is “Making a better Philadelphia through technology.” We use our technology here at iradiophilly to make Philadelphia better through music and community, but there are plenty of other ways to change the city. Go share your ideas and talents. 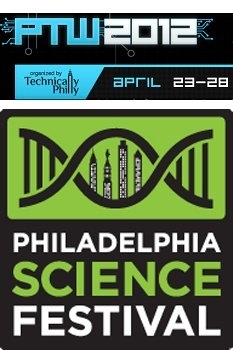 April 20 – 29 is the Philadelphia Science Festival http://www.philasciencefestival.org/. There can never enough science and technology forums going on at once. This week is also in it's second year, but Philadelphia has a long tradition of science and innovation in this country dating back to Benjamin Franklin through today. From PSF's website, “Every April Philadelphia's schools, universities, cultural institutions, and research centers unite as one to put science in the spotlight. Scientists and engineers throughout the city offer fun, interactive programs for Philadelphians of all ages.” Check out the list of events, featuring lectures, debates, hands-on activities, special exhibitions and a variety of other informal science education experiences for Philadelphians of all ages Events . You'll be able to find something to get involved with, take your kids, and see how science is vitally important but also how fun and exciting it can be. Philadelphia Flyers eliminated the Pittsburgh Penguins with a 5-1 victory in Game 6 of the NHL Playoffs. Flyers move on the the Eastern Conference Semi-finals, still awaiting their opponents. Phillies lost to the Padres 6-1 to split the series 2-2, they head to Arizona tomorrow.